“Plymouth Massachusetts was founded in 1620 by the Pilgrims and, unlike Jamestown, was founded by citizens who were fleeing religious persecution and searching for a place to worship God as they saw fit. This search for religious freedom led to the founding of the 2nd permanent English colony in America. One souvenir that is very appealing includes all the high points of interest in the town of Plymouth. Included are the Founding Fathers Monument, Plymouth Rock, Plymouth Plantation, Massasoit Statue, The Mayflower and Plymouth Light. This piece was made in the 1950-60’s and was manufactured in Japan. (Many such cityscapes from the time period are manufactured there as well) It is mostly found as a paperweight, but has been made as an ashtray as well. One of the points of interest on the left of the cityscape is the Statue of Massasoit. 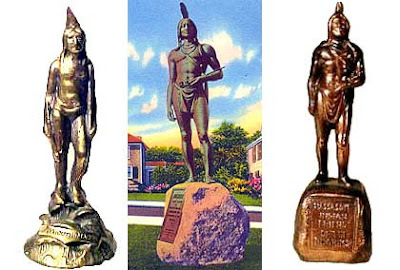 Massasoit (meaning “great sachem”) was the name used by the Pilgrims for the leader of the Wampanoag tribe. His real name was Wawmegin, or "Yellow Feather." Massasoit remained friendly and accommodating to the newcomers throughout his lifetime. With Massasoit’s help, the colony’s success was ensured. The statue of Squanto is not far from Plymouth Rock. Not surprising, there are souvenirs of the statue. One is from the 1920-1940’s and is on the left in the photo below. It is made of lead, but the manufacture is unknown. Another version of the same statue is from the 1950-1970’s made out of pot metal, on right in the photo below. It is most likely made in Japan. This version has the full bolder base of the real statue. There probably are more monument statues from the Plymouth area. If anyone knows of any more, please feel free to leave a comment. In the next few days, I will introduce other souvenir monuments and buildings related to the Pilgrims." - Scott.